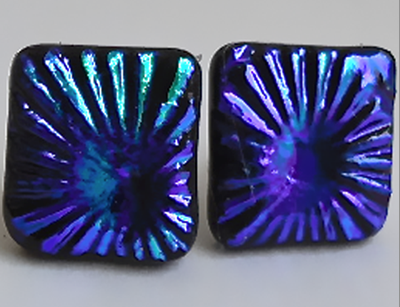 Small square Purple/Turquoise textured Dichroic glass stud earrings. They measure 0.9cm x 0.9cm and are made of a layer of textured Purple/Turquoise Dichroic glass. This glass is hard to photograph because the colours shift from Purple to Teal in the light. They have Sterling Silver fittings.